Need a chocolate fix in the morning? This will get it done. This is an adult cereal. By that I mean it’s not sweet, even though the second ingredient on the label is milled cane sugar. 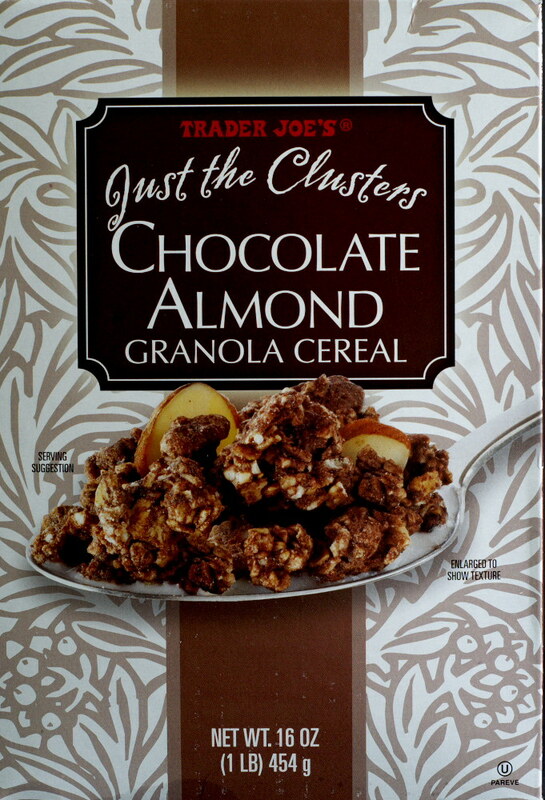 The almond slivers and the few chocolate chunks in the cereal are inconsequential. Both are overwhelmed by the cocoa flavor. Cocoa powder is the 4th from last ingredient on the label. But it punches well above its weight in dominating the flavor. For this household that’s a good thing. Nutritionally, like most breakfast cereals, there’s not much here. Even though not sweet to the taste, total carbohydrates are 38g per serving size. That’s equivalent to around 3+ slices of sandwich bread. Since rolled oats are the primary ingredient, there are 4g of fiber per serving. The calorie count per listed serving size is 250. However if you visually fill the bowl your serving size is likely to be bigger. That’s because the “clusters” (if they can even be called clusters) here are very small. So if you want to keep your calorie count down to the number on the box, weigh this one or underfill your bowl compared to other cereals. Part of the small cluster size may be from the granola breaking apart during shipping. Regardless, be aware. This was eaten dry, as a snack, and with almond milk. Both testers liked the cereal. This entry was posted on 05/23/2018 at 09:28 and is filed under food, Recipes, food, cooking and related items, Trader Joe's. You can follow any responses to this entry through the RSS 2.0 feed. You can leave a response, or trackback from your own site. Thanks. Yep, lots of carbs. That’s about 30 minutes of fast walking to burn it off, otherwise it’s going straight to fat. Trader Joe’s have so many interesting and unique snacks to offer. Wish there was a store where I live now. This one looks tasty fine! I don’t think I could eat that for breakfast. I am more a wheat flakes and fruit sort of girl. I wonder if you could eat this as a snack without milk. That’s exactly what I do, as a snack dry. It’s very chocolatey, but not sweet. I eat most cold cereals dry including wheat flakes with raisins. Although, in general, I don’t eat cereal often. Sounds great. I’ll have to try it! It’s a nice change. The chocolate Os seem to have disappeared from the shelves. They were good too.